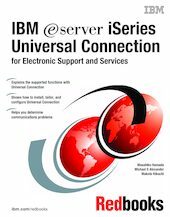 Introducing IBM eServer iSeries Universal Connection! Now you have more options in OS/400 V5R1 and V4R5 for Electronic Customer Support (ECS) and Electronic Service Agent connectivity. Universal Connection offers dial-up support over TCP/IP via AT&T Global Network Services. It supports an Internet connection using a virtual private network (VPN) for more secure connections over the Internet. You can have a direct Internet connection through an integrated modem (9771) with an Internet Service Provider (ISP) of your choice. Or you can have higher speed direct Internet connections (T1, T2, Ethernet-attached cable, or DSL modems). This IBM Redbooks publication explains how to use the variety of ESP support tools that report inventories of software and hardware on your machine to IBM so you can get personalized electronic support, based on your system data. This helps streamline your support process so that you can spend more time running your business rather than maintaining your systems. You control the transmission of data to IBM (what is sent and when it is sent). Then IBM helps secure your customer data and use that data to appropriately provide you IBM’s world-class, personalized support. This book also shows you how to install, tailor, and configure the new Universal Connection Wizard for your environment.